These were the seeds which first gave life to Holy Redeemer by the Sea Parish, and which continue to sustain it today. Formal Catholic worship on the Outer Banks began around 1929, when Helen Norbeck Lawrence, a well to do and devout Roman Catholic, agreed to make her new home here only if she would be able to continue attending Mass. With no Catholic parish in the area, Helen and her husband, Harry C. Lawrence, were able to enlist the help of Father Howard Lane from Elizabeth City, who agreed to travel at least once a month, via ferry and miles of unpaved roads, to the Lawrence home on Bodie Island to say Mass for the Lawrence family and a handful of Catholic neighbors. Helen’s love of the Eucharist was the first step in the history of the Outer Banks Catholic Parish. In the early 1930’s, the construction of toll bridges over the Roanoke and Currituck sounds opened the Dare beaches to increasing numbers of residents and vacationers, many of whom were Catholics. Soon, the needs of the faithful could no longer be served by a weekly Mass said in private homes or the various neighborhood spaces borrowed for that purpose. In fact, in 1937, Bishop William Hafey, the First Bishop of Raleigh, celebrated Mass in the Amphitheater of the Lost Colony in Manteo. Even though Helen Lawrence and her family had since moved to New Bern, her support of the Catholic community on the Outer Banks never wavered. Around 1937, she and her husband donated a piece of land on the west side of the Virginia Dare Trail, now the beach road in Kill Devil Hills. Father Michael, OSB, a monk from Belmont Abbey, who had been an architect before entering the monastery, designed a number of Churches throughout North Carolina. He was called upon to design the first formal Church building for the Outer Banks. Father Michael’s design became a reality in the skillful hands of Frank Stick, a successful local author, artist and real estate developer. Under his guidance, the construction of a small church, which seated about 84 people, was completed in 1938. The Diocese of Raleigh then formally established Holy Redeemer by the Sea Parish. For the next several years Father Michael Carey came from Elizabeth City to say Mass at least once a month on the Outer Banks. The size of the congregation ranged from just two families some winters to many times that during the summer months. During the war years Catholics assigned to the Buxton Naval Station added to the size of the worshiping community. Father Thomas Carney, also from Elizabeth City, succeeded Father Carey and continued to say Mass for the small but steadily increasing Catholic population on the Outer Banks. As a growing infrastructure of roads and bridges allowed greater access to the Outer Banks, the area became a popular vacation destination for residents of northern states including Pennsylvania, New York, New Jersey and Ohio. Many of these seasonal visitors were Catholics who needed a place for weekly worship. The Diocese of Raleigh, recognizing the growing desire and demand for regular worship on the Outer Banks, assigned Father James R. Jones as the first pastor of Holy Redeemer by the Sea Parish in 1955. He served in that capacity until 1957, living first in modest accommodations attached to the Church and then in a rectory built under his direction in 1956. He also began saying Mass in Buxton around that same time. Father Jones was succeeded as pastor by Father Peter Denges who saw the parish through the Ash Wednesday storm in 1962. Parishioners remember how Father Denges, faced by rising water which had breached the rectory, fled to higher ground taking the Blessed Sacrament with him. In 1965, Father Joseph Klaus became pastor of Holy Redeemer, and armed with inspiration and vision, purchased parcels of land for the future growth of the parish. One of these acquisitions was the local Shrine Club which was built in 1952 in Whalebone Junction. The location had a colorful past and was at one time a night club called The Jokers Three. It is now the site of our chapel, Holy Trinity by the Sea, where Catholics from the southern beach communities and nearby mainland counties gather for weekly worship. Father Klaus was also a Navy Chaplain and ministered to the Buxton Naval Station. Thanks to his foresight, land was also purchased in Buxton on which Our Lady of the Seas Church would be built some thirty years later. A series of dedicated pastors followed. Fathers Leo McIllrath, William Frost, and Joseph Baumann all continued to shepherd the growing flock of Catholics on the Outer Banks, caring for both the spiritual and physical needs of the growing parish. A population explosion on the Outer Banks, of permanent residents as well as seasonal visitors, necessitated the expansion of the Church building on the beach road in Kill Devil Hills. Significant renovations were designed by architect and parishioner Donald Olivola. Although this project was completed in 1976, the congregation’s growth outpaced the physical space offered even by the expanded Church building. It was not unusual to have an overflow of hundreds of worshippers attend Mass in the parking lot even as the Liturgy was celebrated inside the Church filled to maximum capacity. The Easter Mass of 1995 was celebrated at the Lost Colony Theater and by some estimates as many as 5000 people attended. With numbers like this, it was inevitable that plans for a new and much larger Church building would begin to unfold. Under the guidance of Father Terry Collins, pastor from 1988-1999, the parish supported expanded ministries in Corolla, Buxton and Ocracoke. At that time, the parish covered more than 4000 square miles of land and water. In the early 1990’s, a church was built in Buxton on land purchased by Father Joseph Klaus some 30 years prior. The Buxton Church, Our Lady of the Seas, was dedicated in 1993 as a mission church of Holy Redeemer by the Sea, and was served by Father Andre Izac, a retired Navy chaplain. It became a parish in its own right in July, 2002. Father Collins also encouraged a support system for the growing Hispanic community, including regularly scheduled bi-lingual Masses. The Latino presence in our parish family continues to be valued, considered and supported in all phases of our development and planning. In preparation for the construction of a new, much larger church building to serve the Holy Redeemer congregation, a piece of land was acquired in Kitty Hawk, just a few miles northwest of the Kill Devil Hills Church which had served this Parish since 1938. Fund raising efforts began as architects and engineers designed a space which could accommodate the six or seven thousand worshippers now gathering at weekend Liturgies. However, tragedy struck in June, 1998, when a fire, believed to have been arson, destroyed the Church years before the new building would be ready for use. With heavy hearts, the congregation gathered in August, 1998 for the final Liturgy ever to be celebrated at the Kill Devil Hills site. They left, committing this holy ground to those who would ultimately lay to rest the Church building which had held them in worship for more than half a century. For almost three years, as work progressed on the new Kitty Hawk Church, the faithful gathered in the auditorium of the First Flight Middle School in Kill Devil Hills. The new Church building was designed to offer a reverent and unhurried worship experience for the thousands of people who gather here on summer weekends. Then Pastor Michael Butler (1999-2003) looked forward to a renewed intimacy in the larger space, since more parishioners could gather, meet and pray together, sharing a common Liturgical experience. He commented “Now we’ll have time to do preaching and liturgy, and do it well.” The parishioners of Holy Redeemer by the Sea dedicated their new worship space in April, 2001. The permanent year round congregation, now numbers about 900 households totaling about 1400 parishioners. But thousands of worshippers continue to gather here for Liturgy during the summer months, and, at the peak of the season, the parish serves more people than any other in the 54 county Diocese of Raleigh. 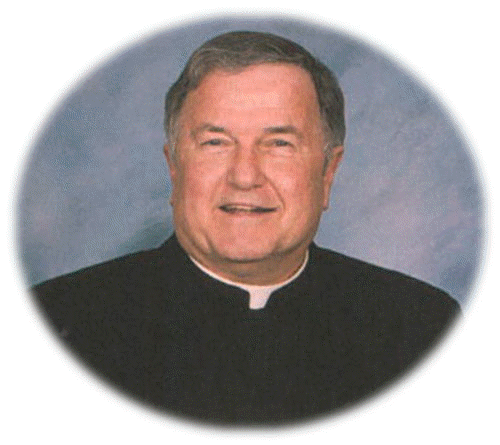 In 2003, Joseph Morrissey, Father Provincial of the Oblates of Saint Francis de Sales, accepted the request of Bishop Joseph Gossman of the Diocese of Raleigh to assume the administration of Holy Redeemer by the Sea Parish. He assigned Reverend William Walsh, OSFS, PhD as our first Oblate pastor. Father Bill came to us with a diverse ministerial and educational background, which includes a Doctorate in Ministry from the Catholic University of America. He celebrated his first Mass here on July 12, 2003. Since that day, his journey with the Outer Banks Catholic Community has been often challenging but always rewarding. Building on the maxim of the Second Vatican Council that ‘the Eucharist is the source and summit of all the Church’s activity’, Father Bill immediately re-established the Liturgical Council. This group of dedicated people guides the continuing development of our liturgical life. Locals and visitors alike comment on the exceptional worship experience offered weekly at Holy Redeemer by the Sea. serves all God’s children, and gathers to worship with our Faith Community. community of the Outer Banks. programs to accomplish this vision. providing a welcoming environment for all believers. The members of the Catholic Community of the Outer Banks fully embody their mission. Visitors to Holy Redeemer by the Sea consistently remark on the evident charisms of prayer, welcome, and service, – the hallmarks of our parish. The ongoing and on-growing needs of Holy Redeemer Parish resulted in the assignment of another Oblate Father to serve with Father Bill. Rev. Jim Turner OSFS joined our staff from 2005 to 2007. He now serves in the Diocese of Charlotte as pastor of Our Lady of the Highways Parish in Thomasville, North Carolina. Since April 1, 2008, Father Edward Fitzpatrick, OSFS has served as our Parochial Vicar. Father Bill is inspired and encouraged by the faith of his parishioners, displayed both in their words and actions. “This church has earned a lot of respect in the area for its work with peace and justice, and its rapport with other Christian Churches”. In this regard, Father Bill also mentions that the Parish was instrumental in founding the Interfaith Community Outreach, which coordinates an ecumenical response to those in need on the Outer Banks. He notes also that the Parish provides a social as well as spiritual base for its members, especially important during the less populated winter months. In January 2010 our beautiful Stations of the Cross, hand carved by parishioner Glenn Eure were dedicated. Devotion, Desire, Determination – the foundation of the Outer Banks Catholic Parish then and now. By the grace of God and the work of many hands, we have grown from just a few believers gathered in a private home, to a burgeoning community overcoming challenges of water and fire, to a congregation of thousands gathered each week to fill our magnificent new worship space with their prayer and praise. Truly, this is the temple of the Lord and blest are we to be called to gather here to love God and serve each other.